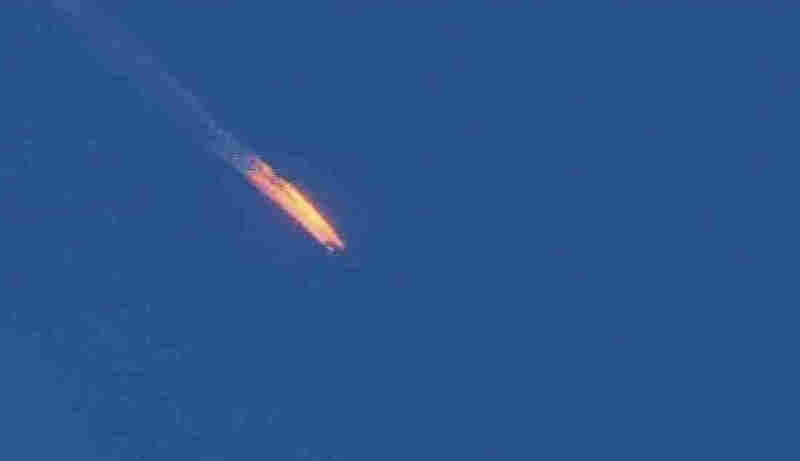 Turkey Says It Shot Down A Russian Warplane Near Border With Syria : The Two-Way Turkey said the plane violated its airspace and that it had issued 10 warnings before firing. Russian President Vladimir Putin said the downing was a "stab in the back by the terrorists' accomplices." This frame grab from video by Haberturk TV shows a Russian warplane on fire before crashing on a hill as seen from Hatay province, Turkey, on Tuesday. Turkey says that after issuing 10 warnings in five minutes, two of its F-16s shot down a Russian warplane that Turkey claims violated its airspace. On Twitter, Russia's Defense Ministry said its Sukhoi SU-24 was flying "only within the borders of Syrian territory." Its pilots, the Russians said, appear to have ejected. Later in the day, Russian President Vladimir Putin called the action a "stab in the back by the terrorists' accomplices." According to The Associated Press, Putin went on to say that there would be "significant consequences." "We will never tolerate such atrocities as happened today and we hope that the international community will find the strength to join forces and fight this evil," Putin said. The Washington Post reports that Russia initially disputed Turkey's version of events, saying the plane was likely downed "due to shelling from the ground." A spokesman for a Syrian rebel group called the 10th Coastal Brigade told NPR's Alison Meuse that it had the body of one of the Russian pilots and also released a video showing the body. The group said the pilot was dead when it found him. He could have been killed in the shoot-down of his jet, when he came under fire during his parachute descent or in a barrage of fire that the rebels laid down to prevent the pilots from heading to a regime-held area nearby. The spokesman said the group does not know the condition or whereabouts of the second pilot. He may have run to regime-held areas. Another Syrian rebel group, the First Coastal Division, tells NPR that it destroyed a Russian helicopter that had landed about 7 km from the area where the Russian jet was downed. The helicopter was shot down by a TOW missile provided by a covert U.S. program to support Syrian rebels, according to the media director for the group, which is part of the Free Syrian Army coalition. The media director did not have information on the Russian crew of the helicopter. The group has released a video purporting to show the attack on the helicopter, showing it engulfed in a huge explosion. "I have previously expressed my concern about the implications of the military actions of the Russian Federation close to NATO's borders. This highlights the importance of having and respecting arrangements to avoid such incidents in the future." The downing of the warplane figured into today's White House meeting between President Obama and French President Francois Hollande, who is trying to shore up support following the recent attacks in Paris. "I do think that this points to an ongoing problem with the Russian operations in the sense that they are operating very close to the Turkish border and they are going after moderate opposition that are supported not only by Turkey but by a number of countries."